As you probably know, the New York Islanders just evened their playoff series with the Pittsburgh Penguins with a gutsy, gritty 6-4 win on Tuesday night. If you don't know, or just want to see again, here are the highlights from the game that tied the series at 2. Yes, Marc-Andre Fleury has been pretty bad in the Penguins net. However, that should not take anything away from the Islanders and what they have done to give the Penguins a test they never would have expected going into this series. After the first period of game two, the Islanders have done a great job of getting to Crosby and Malkin, as well as many other Penguins, keeping off their game and making them stay on high alert whenever they are on the ice. 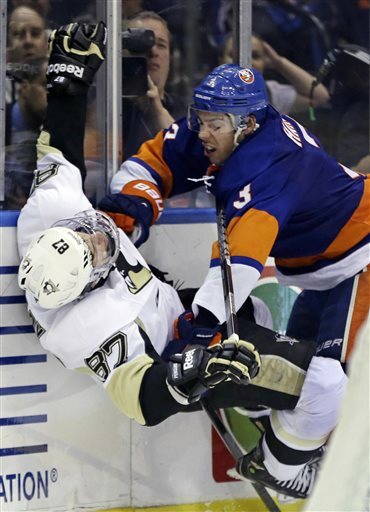 Travis Hamonic has been instrumental in doing that, as he has been the Islanders best physical defenseman. Another key is the Islanders have been getting secondary scoring, especially from the defensemen. Through the first four games of the series, Mark Streit is the Isles leading scorer with five points, including three in the game four win. Lubomir Visnovsky and Travis Hamonic have each added two assists. An unlikely source, former Penguin Brian Strait, opened game four's scoring with a seeing-eye wrist shot from just inside the blue line. The goal was Strait's first NHL goal, playoffs or regular season. Casey Cizikas, who barely made the team out of training camp in January, has more points in the first four games than John Tavares and Matt Moulson. Don't forget about Tavares though, as he scored the tying goal in game three and got the winner in game four.Evgeni Nabokov has been a little shaky in net, but he has made the saves he has needed to with the game on the line. Right now, the series is heading back to Pittsburgh for a pivotal game five in what has turned into a best two out of three series. The madhouse off the Meadowbrook has been rocking, and the old barn will be rocking again for Saturday's game 6. Are the Islanders for real? Can they knock off the mighty Penguins? We'll see soon.